The Moon just before the umbra's 2nd contact, late in the waxing partial eclipse stage of last night's lunar eclipse. This was taken with high ice clouds causing poor transparency. I'm pleased that the results are looking much better than I feared. I'm just starting to work with my HDR data and this is my first sample. Working with 32 bit per channel floating point data requires new steps in my workflow. This image captures the range of colors at the edge of the Earth's full shadow created by light scattered and diffracted through the earth's shadow. The colors here are from the sunset happening over the central Pacific during the eclipse. 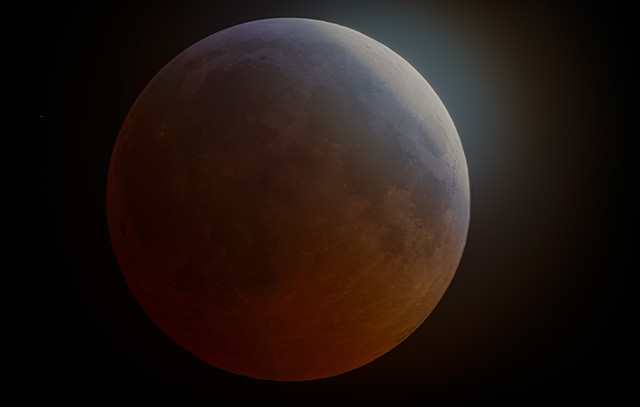 A 9 exposure HDR composite image taken just before totality (U2 --) at 2019-01-21 04:34 UT. Exposures range from 1/8 sec to 30 sec at ISO 200. Questar f/15, 1350/89 mm telescope with Sony a6300 at prime focus.